We've had our crabitat for 3 weeks. After 1 week, one of the crabs disappeared and we could see a pile of dirt where he dug down. After about a week I lifted the hollow cork log that they hide in so that I could empty out the poop that accumulates in there, and was surprised to see the missing crab in a cave-like area RIGHT under the log (not deep at all). He was curled up in his shell. I quickly emptied the log and replaced it. My questions are: At what point in a molt do they leave their shell? Should I stop moving and emptying the log until he's resurfaced? That ‘cave like’ area is his molt cave. The fact that you were able to uncover the crab during this stressful and critical time means your sub level was too low. Your substrate needs to be about 6-8 inches, whichever is deepest. 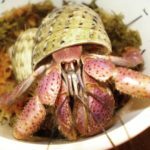 This helps to mask the molting smell from other crabs. Although we can’t smell a crab that is molting, other crabs can if the substrate is too low. The substrate is deep. I think where he went down it is 5-6 inches, that's what I thought was strange, why he didn't go deeper. I would stop moving the log for a couple of weeks. They never leave their shell to molt. They simply shed the outer layer of their exoskeleton when they molt, and then they eat it. There is no minimum/maximum depth where they go to molt - they go where they want. Crabs are weird I hope this answers your question! Could it be he just went down to destress and not molt? Thank you for responding, especially about them staying in their shells to molt. They do have tendencies to molt under a solid object. The actual molt takes a few days, but they can spend weeks to months underground gearing up to molt and then recovering after.